The main idea was that of considering various aspects of art, religion, cult structures and monuments, burial customs and funerary architecture, and other expressions of the spiritual and intellectual life of non-literate peoples as a cultural assemblage which could provide a dimension on the conceptual life of various horizons of human cultures. Rather than separating specialized sectors of rock art, mobiliary art, burials and other expressions of human creativity, as is sometimes customary, the Commission intended to invite experts to focus on a wider debate and create a permanent dialogue on the global phenomenon of the intellectual and spiritual manifestations of pre-literate and non-literate societies. The purpose is to explore the human soul, using the material outputs. “The material heritage as a source to discover the immaterial heritage”. Another aspect of our goals is developing cooperation and joint studies between different disciplines in the humanities and social sciences. 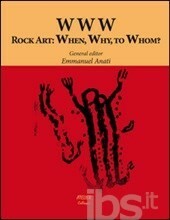 Rock Art: When, Why and to Whom. 2015. Guest Editor Emmanuel Anati, Atelier.